Remember that little laptop I reviewed a while back and just loved? The Asus ZenBook 14. Man, I miss that thing. Well, I had said it was a $1500 laptop, and that was because it was really hard to find availability and the actual price - but as of April it'll be a lot easier to find as that's when it's officially slated to be available in Canadian areas. 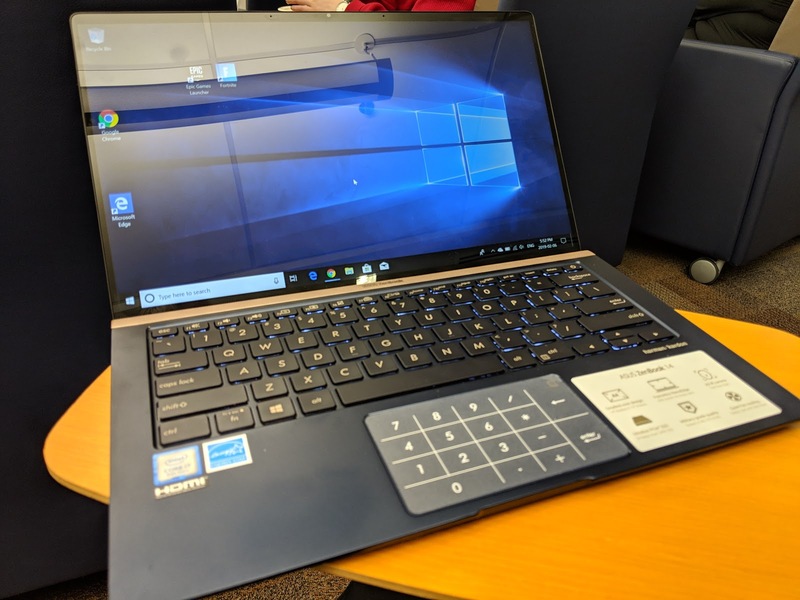 Markham, Canada March 12, 2019 — ASUS today announced ZenBook 14 (UX431). It balances value and performance to deliver a sleek, sophisticated ultraportable that doesn’t compromise on power. This premium laptop is packed full of the latest technology that includes 8th Generation Intel® Core™ processors, NVIDIA® GeForce® MX150 graphics, up to 16GB of RAM, ample SSD storage space and the latest connectivity options. The ZenBook 14 is available now, in two configurations, starting at $999.99. ZenBook 14 exudes sophistication without screaming for attention. Its Utopia Blue colour and spun-metal finish are decidedly chic while still being distinctly Zen. Lifting the lid reveals a 14-inch FHD (1920x1080) IPS NanoEdge display that offers great viewing angles and uniform colour, whether the user is sitting square in front of it at work, or lounging to one side watching Netflix. For a more immersive experience, the NanoEdge display technology shrinks the bezels on either side down to just 6.5mm while also cutting down on the laptop’s overall size. Thanks to the narrow bezels, ASUS engineers were able to squeeze the 14-inch screen into a compact 13-inch chassis. Portability is about size as much as weight, though, and ZenBook 14 weighs just under 3.2 pounds, making it easy for users to slip it into their bags or tuck under arm and carry anywhere. When taking notes in a meeting, tabbing over to check an email, and then switching over to edit a video presentation, capable hardware is what helps maintain smooth performance. Intel’s 8th Generation Core i5, and i7 CPU options offer up to four Hyper-Threaded cores that run at frequencies as high as 4.6GHz thanks to Turbo Boost technology. The integrated Intel UHD Graphics 620 engine is ample for photo editing and video streaming, but upgrading to discrete NVIDIA GeForce MX150 graphics with 2GB of dedicated GDDR5 memory makes light gaming an enjoyable option. These days, 8GB of system memory is a common luxury for mobile multi-tasking, but ZenBook 14 is available with up to 16GB of RAM to ensure seamless switching between tasks. On top of that, up to a 512GB SSD provides a powerful combination of low latency and high capacity. · The ASUS ZenBook 14 (UX431FA) with Intel Core i5-8265U, 8GB RAM and 256GB storage is available for $999.99 (MSRP). · The ASUS ZenBook 14 (UX431FN-IH74) with up to an Intel Core i7-8565U, 16GB RAM, and 512GB storage will be available for $1,399,99 (MSRP). · ASUS won 22 prestigious iF Product Design Awards, including twelve for ROG products. · Award winners include motherboards, notebooks, desktop PCs, monitors, routers, keyboards, healthcare devices, robots, components and accessories. · The winning products stood out from a large field of 6,375 entries from 52 countries. Markham, Canada (March 15, 2019) — ASUS today announced wins of 22 prestigious iF Product Design awards, a new record for the company for the most winners in one year. Spanning five product categories, including Gaming Hardware/VR, Computer, Telecommunications, TV/Cameras and Medicine/Health, the award-winning products represent the ASUS commitment to design innovation and engineering excellence. The award-winning products were selected from a competitive field of 6,375 entries from 52 countries. The newly re-engineered ROG Strix GL12CX further pushes the limits of extreme gaming performance and features a striking, unconventional design. This Windows 10 gaming desktop now boasts the latest 9th Generation Intel® Core™ i9-9900K processor (factory overclocked up to a top speed of 5.1GHz) and NVIDIA® GeForce® RTX 2080 Ti graphics for unrivaled gaming experiences. It features the ROG-exclusive DIMM.2 module with support for dual SSDs that can be configured in RAID, along with tool-free expansion bays and an esports-ready hot-swap SSD tray for easy upgrades. A transparent side panel and Aura Sync lighting effects let users customize the colours of ROG Strix GL12CX, inside and out. ASUS FX HDD is the world's first 2.5-inch external hard drive featuring Aura Sync RGB lighting technology, which provides a brilliant, personalized look with more than 16 million colour options and works with other Aura-enabled products, enabling gamers to create a system with synchronized lighting harmony. Available in 1TB and 2TB capacities, ASUS FX HDD provides ample space for storing large files and data backups, and USB 3.1 Gen1 connectivity ensures fast data transfers. Optional 256-bit AES encryption lets users easily protect private data and access it with a personalized password. Additionally, ASUS engineers performed stringent 24/7 stress testing on the hard drive to ensure reliability and data integrity. ZenBook 13, 14 and 15 introduce the stunning new frameless ASUS NanoEdge display, with ultraslim bezels on all four sides for an unrivaled up to 95% screen-to-body ratio and a near-borderless viewing experience. The ultra-compact design, which incorporates the unique ErgoLift hinge mechanism that tilts the keyboard for comfortable typing, gives each of these laptops the world's smallest footprint in its class. ZenBook 13 and 14 also introduce include the exclusive new NumberPad, an innovative LED-illuminated numeric keypad built into the touchpad. The new models feature a full complement of high-performance components including the latest 8th Generation Intel® Core™ i7 quad-core processor with integrated dual-band gigabit-class Wi-Fi 5 (802.11ac) and up to NVIDIA® GeForce® GTX 1050 Max-Q graphics. ASUS VivoWatch BP is the world's first wearable health tracker to integrate a pair of medical-grade Electricalgraphy (ECG) and Photoplethysmography (PPG) sensors as well as ASUS HealthAI technology, providing 24/7 health-trend tracking and data analysis as well as fitness-tracking and smartwatch functionality in a compact and lightweight device. Together with the ASUS HealthConnect app, users can manage their blood pressure and heart-rate data in an intuitive and easy way. With 28-day battery life in normal use, VivoWatch BP is designed to be an everyday companion that offers personalized health advice and health-management tips to help users maintain a healthy lifestyle.